One of the easiest ways to achieve instant curb appeal is to add a pop of personality to your front door. Sharon Grech, Benjamin Moore Colour and Design Expert, shares suggestions for painting your front door. 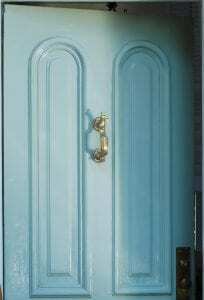 Just remember that dark coloured brick or stone can overwhelm a pale door. For darker coloured homes, choose bold shades, which products like Aura Grand Entrance are specially formulated for. Grand Entrance will stand up to long days in the sun without fading over time. It can be tinted in any Benjamin Moore colour, but Benjamin Moore has also put together a unique, curated palette of 42 most popular door colours. When selecting a front door colour, it is important to consider natural light. North-facing homes tend to attract cool light, and Grech recommends counter balancing this with warmer colours like Firenze AF-225. Conversely, for south-facing homes, the light will likely be warm and intense around noon and a mid-tone, such as Blue Echo AF-505, will look great throughout the day. Always view colour selections outside, to see the true effect of exterior lighting. This will help ensure your paint looks fresh throughout the day and rich in the evening. Whether you decide to be bold with dark colours or prefer lighter hues, Grech suggests earthy tones tend to work well since they are so compatible with the natural elements of the great outdoors.